A Public Realm Strategy is a living plan that can be used to guide public realm improvements in strategic and meaningful ways to create a legible and cohesive environment. The RU Outside: Ryerson’s Public Realm Strategy was developed from the Ryerson University Public Realm Strategy Background Report (2012) and explored the campus’ public realm at a range of scales, highlighted interventions and programming opportunities for nodes, streets, and smaller scale spaces. The students collaborated to weave together existing public realm strengths with a case study analysis, site study observations and consultations. 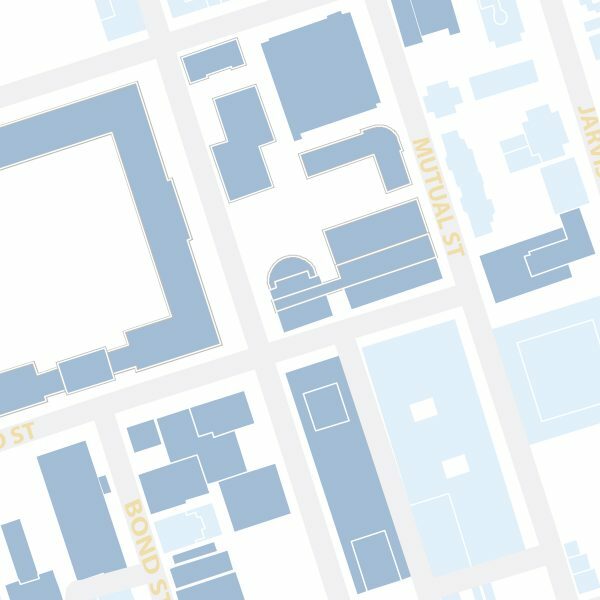 Sites of study included: Ted Rogers School of Management and Victoria Street, Victoria Lane and Bond Street, Church and Gould Street (Ryerson student residences), Church Street and the Mattamy Athletic Center, Victoria Street North, Gould Street and Ryerson Square, Gould Street and Lake Devo and the Quad. The group presented a narrative of the strategy for all of campus and for each site of study graphically through a mapped tour with images of current conditions and renderings to illustrate recommendations and twelve quick-reference icon labels which illustrated themes including Long Term, Sustainability, Identity, and Quick Win. With reference to the RU Outside Strategy, some recommendations have been implemented on the Ryerson University campus.